..::dan bergeron / fauxreel studios::..
I’m stoked to announce my involvement in the upcoming CONS Project in Toronto on March 19, 2016. I’ll be leading a workshop in how to build a skate sculpture. The sculpture will be donated to Dufferin Grove skatepark afterwards. Please visit CONSProject.com to register now. 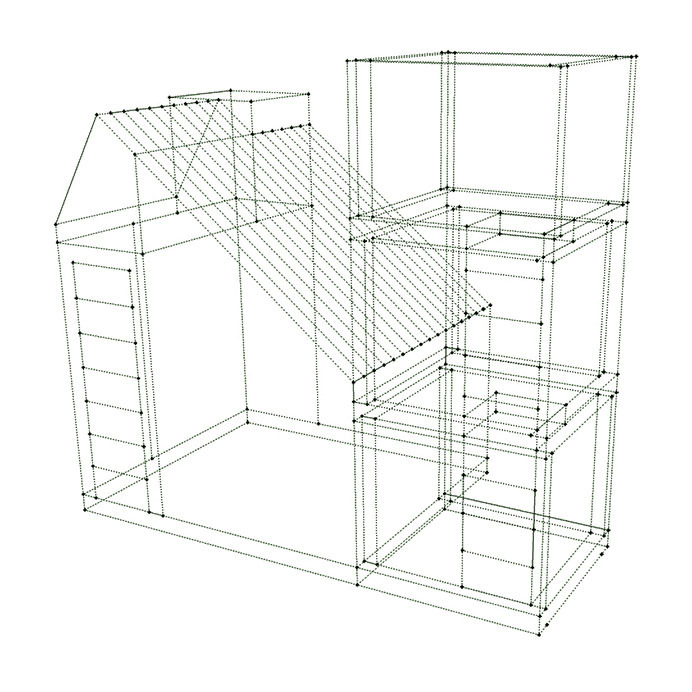 In conjunction with Sukkahville 2015, I have been commissioned by the Koffler Centre of the Arts to create a re-imagined, contemporary Sukkah: which is a temporary outdoor hut built for one week and in which it is customary for families to share meals during the annual Jewish holiday of Sukkot. As part of the project I’ve been invited to share a conversation with MOCCA’s Artistic Director and Curator David Liss about my practice, public art and how to steal a piano from a public space in the middle of the day. Just seeing if you’re paying attention. Please join us at the Small World Music Centre in Artscape Younplace and be prepared to ask questions, contribute and get animated. Full details here. 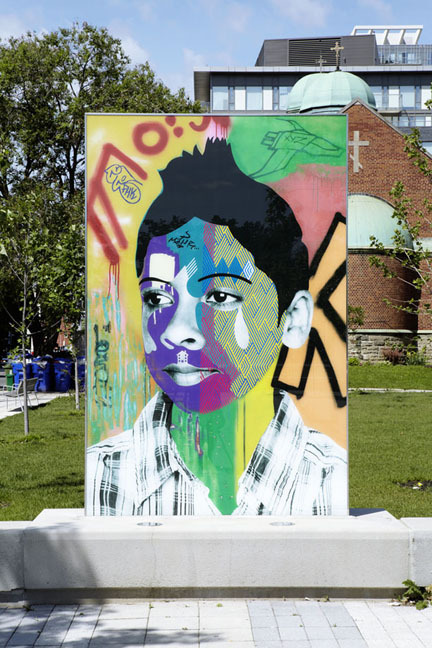 It’s been a long time coming and the Faces of Regent Park permanent public artwork is now complete. You can check out a gang up of the portraits at this link and images of the installation by visiting the projects page of the website. A special thanks to all of the subjects for trusting me and sharing their time and their stories, The Planning Partnership, Clara Hargittay and the folks in Arts & Culture and Parks at the City of Toronto, Artscape Daniels Spectrum, Dinny Biggs, Svetlana Lavrentieva and Stadia. The birch panel studio works that form the basis for the outdoor installation will be on display until July 10 on the 2nd floor of the Daniels Spectrum, directly across the street from where the outdoor works reside. Over 18 days in May I had the pleasure of working with my good friend Gabriel Specter on a mural in Toronto’s Cruickshank Park as part of the Pan Am Path Art Relay. 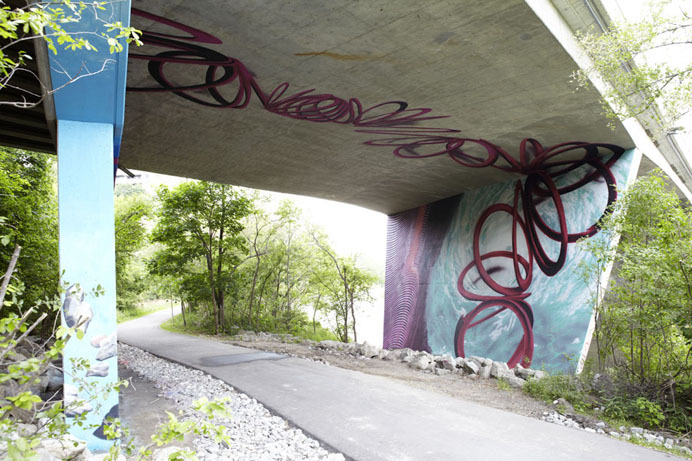 The mural depicts the energy of Hurricane Hazel which struck Toronto on October 15, 1954 and caused severe damage to many of the low lying areas along the Humber River. As a result of this storm, however, the TRCA was born and spaces along the Humber, like Cruickshank Park where the mural is located, were redeveloped to the benefit of all Torontonians. Special thanks to the folks at UrbanArts, City of Toronto Parks and Friends of the Pan Am Path. 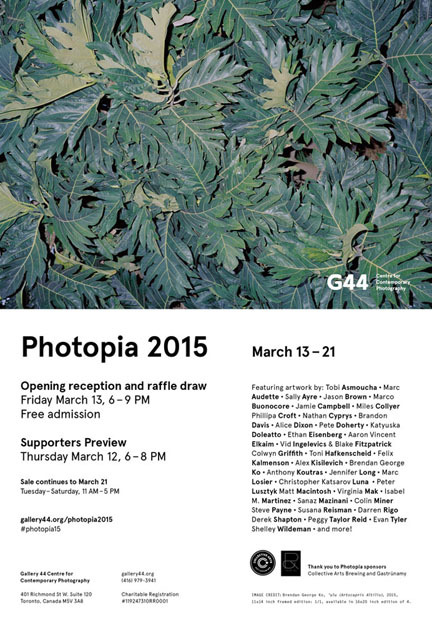 Stoked to be in the upcoming Photopia 2015 group show that supports the excellent work of Gallery 44. The opening reception is this coming Friday March 13, from 6 – 9 pm. 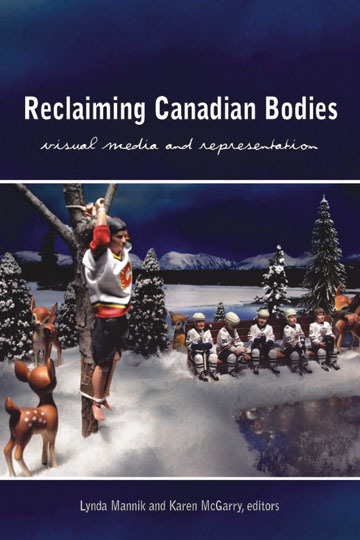 Great essay by Chris Richardson in the newly released book, Reclaiming Canadian Bodies, published by Wilfred Laurier University Press. The essay compares the impact of my Regent Park Portraits and JR’s 28 millimètres: Portrait d’une génération in respect to how portraits in public spaces can, “…oblige viewers to rethink the stereotypical representations of low-income neighbourhoods that are commonly promoted in visual media.” Honoured to have my work mentioned in the same vein as JR’s. Inspirational day. 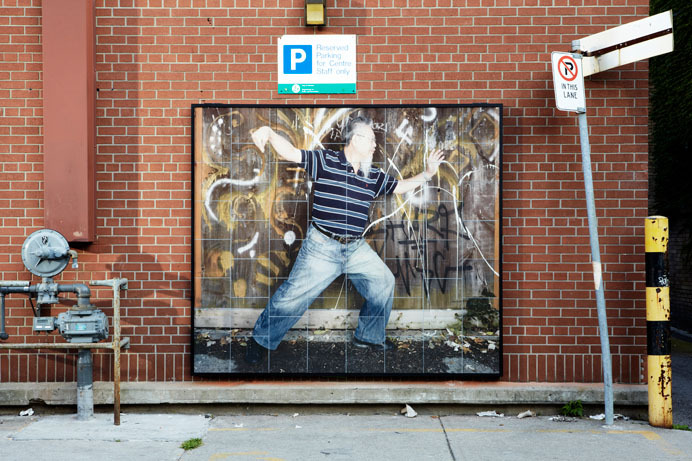 Just installed some new permanent works with funding I received from Street Art Toronto. Tai Chi Tiles is a series of tile-based portraits of Chinese seniors who practice Tai Chi in Toronto’s Grange Park. Big thanks to Stefan, Rocky and Gord at Punchclock Metalworks for fabricating the frames and working with me to install the work. New work with Paul Aloisi at the Evergreen Brickworks. 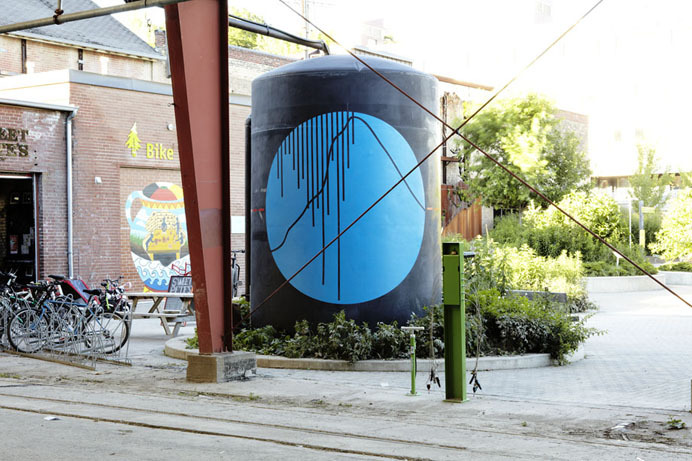 Flood Lines creates a spatial dialog between three cisterns and the roof which they collect water from to address the increasing frequency of heavy rainfall events in our contemporary climate. Happy Good Friday. Spring is finally here, perhaps, and are a bunch of things coming up. 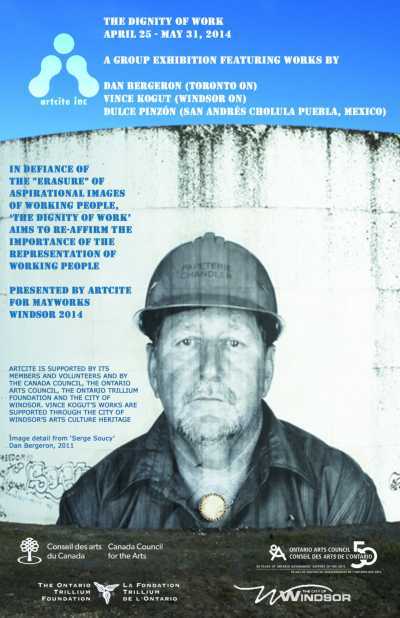 I will be part of a group show at Artcite in Windsor, Ontario call The Dignity of Work, running from April 25 – May 31. I’m showing four large-scale prints from my Gaspesia: Les portraits en papier series. Those interested in a print can send me an e-mail or inquire with the folks at the gallery. If you’re in the Windsor area please check out the show and the great work by the two other artists, Vince Kogut and Dulce Pinzon.